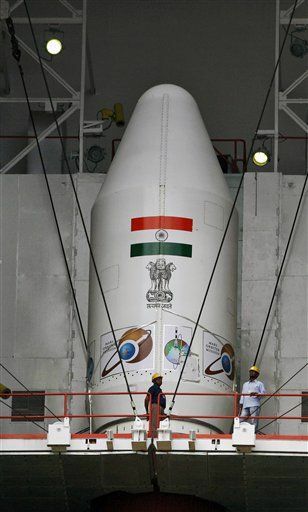 (Newser) – It may soon get a little more crowded around Mars: India has successfully launched a spacecraft headed for the red planet, putting the country a 300-day journey away from being the fourth space agency to get there, the BBC reports. The Mars Orbiter Mission took off from a base on India's east coast this morning and if it survives the journey, it will carry out experiments including searching for methane in the Martian atmosphere. Let them eat cake. This is perverse. Is THIS why Gandhi died? A million Brahma bulls walking down the streets of their biggest cities and they are starving. Their public bathrooms are just cement benches with holes where a lady comes along and scoups it up throughout her shift. People sit on the top of their overloaded trains but they do run to every city, unlike in the USA. They can make a movie for $1000 USD and it will gross $2MUSD and that's a bad movie. Real Indian food is mostly spices and curry. Most Westerners can't eat it. I tried to get this Hindu woman at work to bring me a dish made for her husband and kids. But she kept saying I would die. Her chicken and rice was just out of this world. I wanted to make her my own beef noodles curry but they don't eat beef. I use freeze dried beef like you use on backpacking trips. I invented in on a 200 mile hike. It was our last night and I had noodles, spices, and some freeze dried beef. I started out with some squeeze Parkay and melted it then added water, curry, and a pinch of all the other spices I had. Then once it got hot I added the beef and dry noodles. I simmered it very slow until the meat and noodles has absorbed much of the water and it was thick. Then I served it and 20 years later guys who see me will say, "I sure could use some of that beef curry you served." I told them there were two problems. I have no idea on the spices, and hunger is always the best spice in your bag."